Monday Re-blog and here’s one from September ’11. 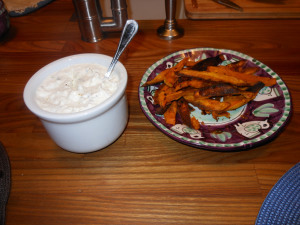 A delicious variation on Sweet Potato Fries baked in the oven with a delightful Tzatziki Sauce served on the side. Looking for something new to do with Sweet Potatoes? this one is perfect and the Tzatziki Sauce is just wonderful . Enjoy!